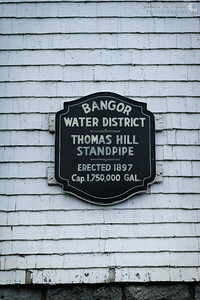 Thomas Hill Standpipe in Bangor, Maine has one of the best 360° views in the area. On a clear day you can see Mt. Katahdin 76 miles away. Click the preview photo to see a 360° panorama from the roof, as well as a spherical panorama of the interior. 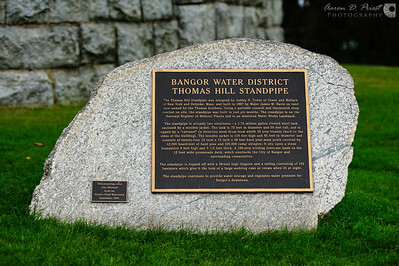 Click the "i" button on each panorama in the virtual tour for more information about the standpipe and the camera settings & equipment used to create the images. 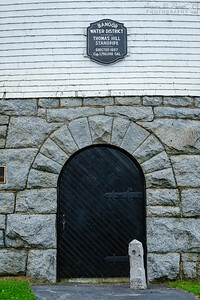 Check out the plaques in the photo gallery below for more information on this amazing landmark. 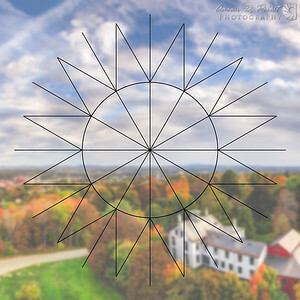 The 360° panorama from the roof was a very challenging image to create. 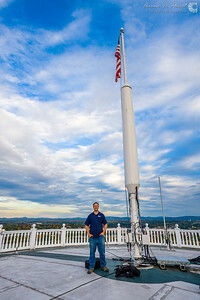 Not only was the sun popping in and out of clouds making a consistent exposure difficult throughout the image, but with a flag pole and antennas scattered about the middle of the roof there is no single unobstructed position to shoot from. I knew that at 24mm in portrait orientation I could rotate every 30° on my panning head and get a sufficient overlap (43%), so I divided the circumference of the tower into 12 positions and took twelve smaller panoramas by shooting 3 directions (one straight ahead from the railing and two off-axis 30° left and right) at each position along the balustrade, hoping the edges of each of the twelve “mini” panoramas would line up with each other to stitch all the smaller panoramas into one large seamless panorama later. I included a diagram here to visualize the technique. I only shot a single row to see if it was even possible to stitch such a complicated 360° image from so many different camera locations. The final image is a little over 92 megapixels and 85” x 19”. 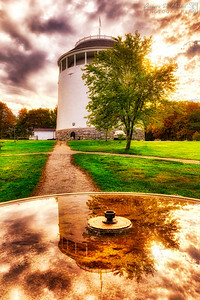 On the way back down I decided to shoot a spherical panorama of the cap that covers the water tower. This is inside the roof area above the observation deck or promenade. It was so dark that I had to use my flashlight to see the index marks on my panning head. The surface of the water inside the tank is a few feet below the floor. 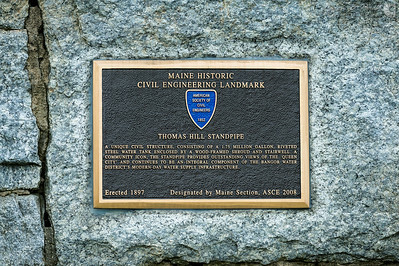 The high-resolution HDR image of the exterior is 172 megapixels, or about 47” x 63” printed at full resolution, taken with a Gigapan Epic Pro and a Promote Control. It is stitched from 140 individual images: 4 columns, 7 rows, and 5 exposures. 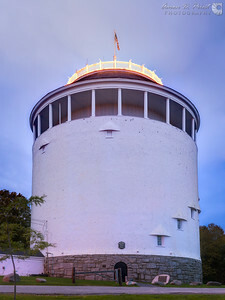 This high resolution HDR image of the Thomas Hill Standpipe is 172 megapixels (11356 x 15160), or about 47” x 63” printed at full resolution. It is made up of 140 individual images: 4 columns, 7 rows, and 5 exposures spaced 1.3 EV apart. Shot with a Nikon D700 and 70-200mm f/2.8 VRII @ 135mm, f/4, ISO 800, and 1/100 to 0.4 second exposures. On the way back down I decided shoot a spherical panorama of the cap that covers the water tower. This is inside the roof area above the observation deck or promenade. It was so dark that I had to use my flashlight to see the index marks on my panning head. That steel drum in the middle weighs 3 tons. 24 iron trusses extend 40 something feet from the drum to the sides of the structure. The 24 beams at the top are 12" x 12" x 48" hard pine posts covered by 42,000 board feet of pine. The surface of the water inside the tank (1.75 million gallon capacity) is a few feet below the floor you see below. Shooting data: 14mm, f/5.6, ISO 1250, 3 second exposures, 2 rows of 6 images, plus 1 nadir shot. Equipment used: Nikon D700, Nikon 14-24mm f/2.8, Promote Control, and Really Right Stuff pano/gimbal head & BH-40 ballhead. 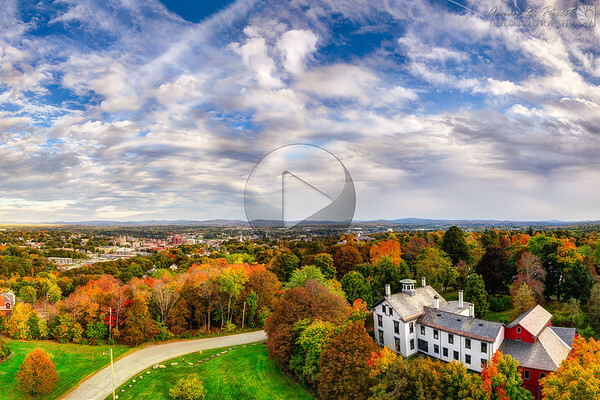 This 360° panorama from the roof of the Thomas Hill Standpipe in Bangor, Maine was a very challenging image to create. 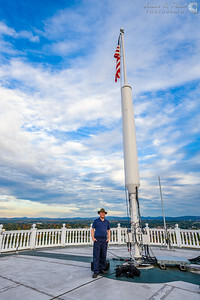 Not only was the sun popping in and out of clouds making a consistent exposure difficult throughout the image, but with a flag pole and antennas scattered about the middle of the roof there is no single unobstructed position to shoot from. I knew that at 24mm in portrait orientation I could rotate every 30° on my panning head and get a sufficient overlap (43%) for panoramas, so I divided the circumference of the tower into 12 positions and took twelve smaller panoramas by shooting 3 directions (every 30°) at each position along the balustrade, hoping the edges of each of the twelve “mini” panoramas would line up with each other to stitch all the smaller panoramas into one large seamless panorama later. Each bracket consisted of 7 exposures to cover the entire dynamic range. I only shot a single row to see if it was even possible to stitch such a complicated 360° image from so many different camera locations. The final image is a little over 92 megapixels and 85” x 19”. Shooting data: 24mm, f/8, ISO 400, and 7 exposures bracketed 1.3EV apart covering 1/8000 to 1/30 shutter speeds. Equipment used: Nikon D700, Nikon 14-24mm f/2.8, Promote Control, and Really Right Stuff pano/gimbal head & BH-40 ballhead. Nikon D700, 24-70mm f/2.8 @ 27mm, f/18, ISO 200, 7 images bracketed 1.3EV stops apart covering 1/200 to 1.3 second exposures.